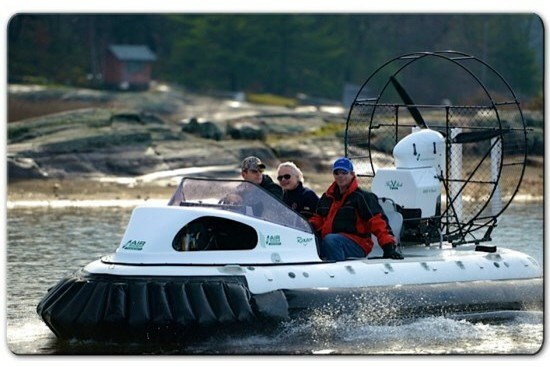 Why, you may ask, is a hovercraft review included in a list of pleasure boat reviews? The answer will become very obvious the first time you ever have a chance to drive one over water. I say “over” water, since that’s exactly what a hovercraft does. It does not operate “in” the water, but hovers over it and moves across the top of it. It is ever fun and totally exhilarating, a whole new feeling and experience. If you try it, you’ll want one. “A hovercraft is a vehicle that can travel over land, ice and water. It rides on a cushion of air and can move smoothly over rough and unstable surfaces in any weather,” states Air Rider in its literature. 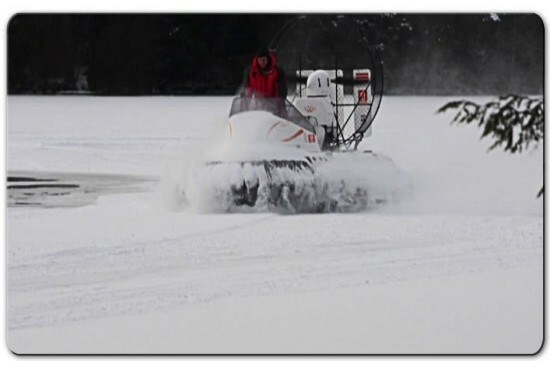 Air Rider Hovercraft International is based in Parry Sound, Ontario and founded by business partners Greg Swanson and Bruce Hatherley (Bruce of Gordon Bay Marine of Mac Tier on Lake Joseph in Muskoka). The company is partnered with long time hovercraft manufacturer, HoverWorks Limited of Christchurch New Zealand and utilizes HoverWorks’ 40 years of engineering experience and design. This writer has followed small personal and large commercial hovercraft design since the 1960’s and has driven and tested several. 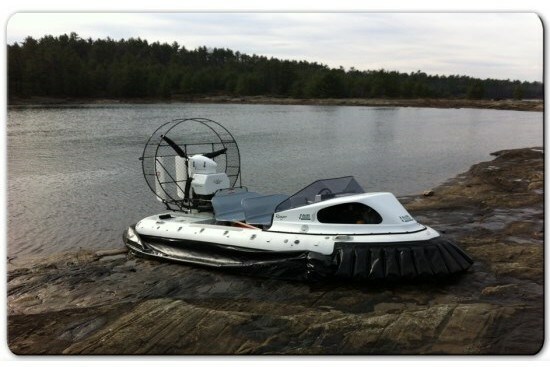 Large commercial hovercraft’s have been proven highly versatile and viable and have a known market acceptance. The military in many countries around the globe utilize them for many applications including troop and equipment transport and they have a proven worth over varied and multiple terrain applications. Hovercraft ferries operate out of Vancouver over to the Island as well as across the English Channel. Their big advantage? Speed. Small personal hovercraft, up until now with the introduction of the Air Rider, have not been able to overcome the physics of being just that, small. In order to get sufficient hovering height in order to clear reasonably sized obstacles or obstructions (logs, waves, rocks, etc.) the machine became too top heavy and tippy. Another problem with these small machines was the inability to stop or back up. There was also the inability to regulate forward speed and lift height unless two separate motors were used. Mainly for these three reasons, small personal-sized hovercraft never caught on. Air Rider seems to have solved all three of these issues to make the pleasure hovercraft affordable, practical, and loads of fun. Air Rider is presently offering three models; AirRider 23 Sport, AirRider 34 Cruiser, and AirRider 45 Ranger. All three are the same width and height at 7’11” and 7’9” respectively with the overall length ranging from 14’1” for the Sport, 15’4” for the Cruiser, and 17’ for the Ranger. The Sport and Cruiser models are otherwise very similar with the only real difference being that the Sport has seating for three and the Cruiser, four. The Sport and the Cruiser use one engine for both propulsion and lift whereas the more “workhorse” Ranger has a separate engine for each of those purposes. 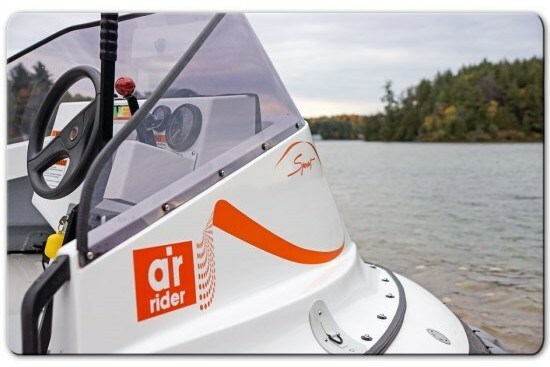 The Transport Canada approved unique hull design of the Air Rider features a five-chamber inflatable hull, similar in looks to any popular inflatable dinghy, which surrounds the supporting framework structure of the hovercraft. Air Rider then utilizes a hybrid skirt system, a unique combination of both loop skirt and segment skirt technology, combining to provide stability, protection against abrasion, and anti-spray qualities. This hybrid skirt system, to quote Air Rider, “ensures the craft will not sink if punctured or damaged.” When fully inflated, all three Air Rider models claim hard structure obstacle clearance of 17”, quite sufficient for most beaches, trails, and wave conditions. An air-cooled, V-twin CH1000 Kohler Command Pro 4-stroke, 40-hp engine offers high torque characteristics at low rpm, making it ideal for this application of providing both lift and propulsion in the Sport and Cruiser models. A second 20-hp version of this engine provides the necessary lift only in the larger Ranger model. I say “ideal” as lower RPM means lower noise levels, one of the annoying drawbacks of much earlier hovercraft design. In fact, with its specially designed muffler and low RPM engine and propeller, the Air Rider is claimed to make only slightly more noise than a vacuum cleaner at cruising speed and much less noise than a rotary lawn mower at full throttle. Amazing really. But, the key to all of this capability and flexibility lies in the Air Rider’s unique variable forward and reverse (VF/R) pitch propeller design. This refers to the vertically mounted propeller visible at the rear of the hovercraft and used for forward (and reverse) movement. A second turbine-type horizontal fan is centrally mounted below the floor frame to provide lift. In the old hovercraft designs, to decrease speed, the throttle was decreased which in turn decreased the speed of the lifting fan, thus lowering the amount of ground/water clearance – unless of course two separate motors were used (as in the Ranger model) which increased weight and cost. The only way to stop these old designs was to pull back on the throttle, stop the propeller and fan, lose lift and momentum, and let the hovercraft drag to a stop. A variable pitch propeller allows the throttle to be set at optimum speed where lift is optimized and then forward momentum and speed becomes relative to how fine or coarse the propeller pitch is set. Braking is also established by reversing the pitch while in forward motion, and the hovercraft will slow down, stop, and then even move backward. Amazing on a hovercraft of this size. Steering is provided by twin rudders in the propeller slipstream. Cruising speed at 70% power is claimed to be 36 mph on the Sport, 33 mph on the Cruiser, and 34 mph on the Ranger.